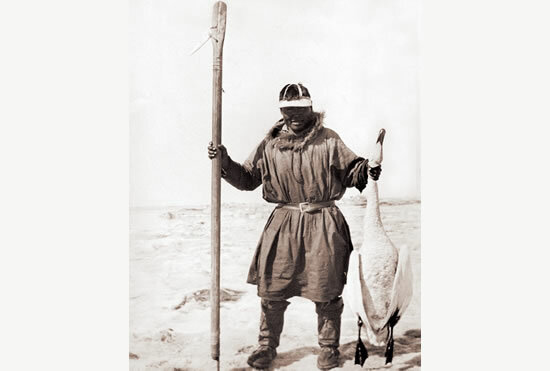 Coastal hunter holding a gaff and tundra swan. 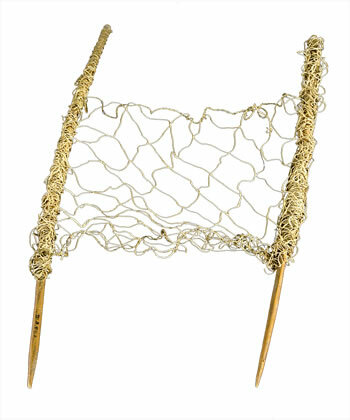 Bird decoy attached to the end of a fishnet to attract birds. Frank Andrew said: "One sits still behind it. When birds land, he shoots an arrow at them. I think this is a spectacled eider decoy." Three-pronged bird spear and another with prongs midway down the shaft. 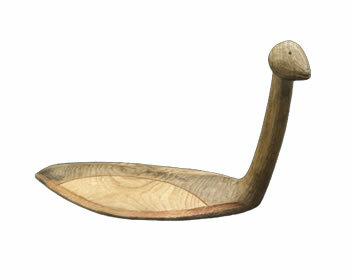 Peter John said: "The nuusaarpak was used all the time for hunting food. It was like a .22 rifle and was always available in the kayak." Ptarmigan Net from the Kuskokwim. "Old women were never without ptarmigan nets," recalled Willie Kamkoff. "My grandmother also took a decoy made of a male ptarmigan's skin stuffed with moss to attract those birds." Bola with walrus-tooth weights. Phillip Moses described bolas in flight: "Men waited by lakes and threw bolas at birds when they flew. When the bola hit, it wound around the bird and made it fall."